One of the kind of cool side effects of Free Comic Book Day is that we always gets loads of photos from the insides of comic shops. This is cool because it promotes the popularity of comics and how comic shops are bustling places with ample customers, but it's useful because it shows how other shops are laid out, and we can take best practice notes from some of them. In this year's crop of photos, I noticed a theme that I don't think I'd noticed before. At least, not outside a few select shops. Here's a picture from Lee's Comics in Northern California... You might guess from the title of my post that I want to focus on the bookshelves here. But that's only indirectly the case. I want to focus on the fact that the reason there are bookshelves is because there aren't tables full of long boxes. 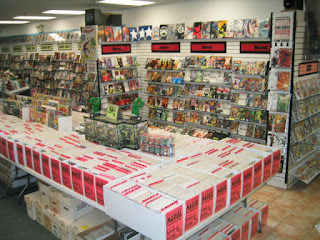 As a quick contrast, here's a shot (not taken on FCBD) from another California shop, Zero to Hero... The difference is not so much one of trying to not fill the store with relatively unattractive cardboard boxes (though that is a by-product) but to cater more towards the TPB and hardcover markets. I have noticed some shops over the years going in that direction and it makes sense. Fans are hunting more for older stories, not necessarily older issues. And since much of what has been published is available in reprint form, it makes more sense to work with those since A) they're generally cheaper, and B) you don't have to hunt for that one issue in the middle of an arc that nobody seems to have in stock. I've talked about this change from long boxes to bookshelves before, first noting it in 2009. But with this year's round of FCBD photos, I'm seeing a broader shift in the retail side as a whole. This is just anecdotal, of course, but I think we've hit a tipping point where we start seeing comic shops collectively realize how much better their limited space can be utilized with bookshelves, relegating their long boxes (which weren't selling all that well any more anyway) into storage except for large events, ebay and maybe conventions.